The Pueblo FireFighters Historical Society was started in 1995 by a group of Pueblo firefighters led by (now retired) Capt. Larry Bond. The Pueblo City Council gave the firefighters a loan of $17,000 to purchase Pueblo's first motorized fire truck, a 1911 American LaFrance Chemical Wagon. The loan was soon repaid with the help of donations from firefighters, the IAFF Local 3 fire union, and area businesses. Pueblo FireFighters Historical Society Founder and Past President, Larry Bond. 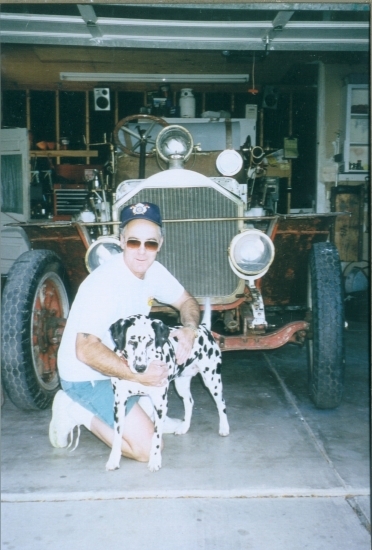 He is pictured with the 1911 American LaFrance Chemical Wagon when it was purchased. Since that time, the historical society has become a 501(c)3 non-profit entity, which has acquired 4 additional fire apparatus that belonged to the Pueblo Fire Dept. (see the Historic Fire Truck tab) plus the Model T. We also started running the Hose Co. No. 3 - Fire Museum in 2003, and continue to add artifacts, pictures, and history of the Pueblo Fire Dept. and its firefighters, as well as maintaining and restoring the historic fire trucks we have acquired. The majority of funding comes from the firefighters of Pueblo, with donations at the museum and the sale of museum t-shirts and hats also contributing. Many people volunteer many hours, committed to preserving our history. Award presented to the Pueblo FireFighters Historical Society.